Through the Rappaport Institute for Greater Boston, Kanika Singh worked for Boston’s Department of Innovation and Technology to study the needs of refugees settling in the area. State Sen. John Keenan used to get on a Red Line train in Quincy and ride into downtown Boston every morning, peacefully listening to music on his earphones and contemplating the day ahead on Beacon Hill. These days, Keenan sometimes rides a little farther, to Harvard Square, and spends his time studying signals and delays, wondering why the MBTA doesn’t collect information about where passengers end their trips. Credit Harvard Kennedy School (HKS) and its Rappaport Institute for Greater Boston for that. Keenan, just weeks into his mid-career master’s in public administration program at the School, is already gaining important insights into policy-making, including from transportation expert Jose Gomez-Ibanez, Bok Professor of Urban Planning and Public Policy, on how to use ridership behavior to study public transportation. A 2015 study found that former Rappaport fellows were 54 percent likelier to be working in the public sector several years after graduation than were runners-up who applied for but did not receive the fellowship. Keenan is a Rappaport/Boston Urban Scholar, a fellowship that allows area lawmakers and policymakers to study at HKS. It is one of the notable programs of the Rappaport Institute for Greater Boston, an initiative funded by the Phyllis and Jerome Lyle Rappaport Foundation. “The Rappaport Institute serves as an important bridge between Boston-area universities and Boston-area governments, exposing students to the exciting possibilities of public service, training current government leaders, and identifying policy questions that can be answered only through collaboration between top scholars and front-line government workers,” said Jeffrey Liebman, Malcolm Wiener Professor of Public Policy and director of the institute. Besides the 49 urban scholars, who have included Somerville Mayor Joseph Curtatone, M.C./M.P.A. 2011, and House Ways and Means chair Jeffrey Sanchez, M.C./M.P.A. 2011, the institute has supported more than 215 summer internships for public policy graduate students to work in state or local agencies, and produced more than 85 publications and research projects, including groundbreaking work on education, public safety, and transportation. With the current sharpened awareness of the necessity of a well-functioning government, the Rappaports’ support and initiatives are all the more significant. Kanika Singh, M.P.P. 2018, recently was a Rappaport public policy summer fellow, working for the city of Boston’s Department of Innovation and Technology to study the governance and tech needs of refugees settling in the area. The institute also plays an influential role in bringing in University experts to focus on policy questions specific to the Boston area. By playing matchmaker and helping fund the research, it connects the research needs of local and state government to scholars who can help meet them. Following the 2013 Boston Marathon bombing, the institute co-sponsored a report analyzing the city’s response and resilience in the face of that tragedy. Harvard experts, including Herman “Dutch” Leonard, Baker Professor of Public Management, Arnold Howitt, adjunct lecturer and co-director of the Program on Crisis Leadership, and Philip Heyman, James Bar Ames Professor of Law Emeritus at Harvard Law School, examined the city’s strong response, packaged important lessons, and found ways to improve. In conjunction with Boston Public Schools, the institute recently issued a challenge to area academics to improve the system’s expensive and often inefficient bus service. The winners, a team from Massachusetts Institute of Technology, devised algorithms that minimized bus routes by reconfiguring stops, maximizing the number of students on each bus, and reducing the time buses were idle, saving millions of dollars. 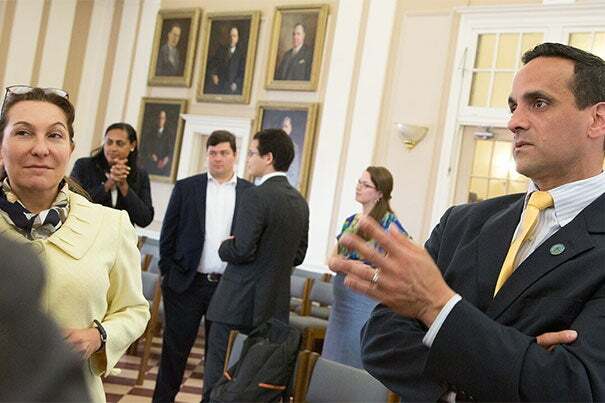 By helping connect Moynihan Senior Lecturer in Public Policy Linda Bilmes with nearby municipalities and public entities, the institute helped to bring new governance to the area, and to change the way the Kennedy School teaches. The institute was an early supporter of Bilmes’ experiential learning lab program, which sent her public finance students to work in Greater Boston, the MBTA, and dozens of local jurisdictions. The class developed a new model in which city officials partner with the School to provide opportunities for advanced budget and technical training. Bilmes has led student teams in more than 70 projects, involving everything from Harbor Island ferries to Hubway bikes. The lab has given valuable new budgeting and governing tools to local communities, served as a model for other experiential classes at the School, and prompted hundreds of students to choose a career in state and local government. “The Rappaport Institute was one of the key enablers for providing a meaningful long-term experiential learning program in which both the students and the local community reaped benefits,” said Bilmes. All these achievements flow from the generosity of the Rappaport family and Jerry Rappaport’s deep commitment to Harvard and the Boston area. From his role in the “New Boston” reform movement, which helped elect Mayor John Hynes in 1949 and transform city governance in the 1950s, to his role in transforming and modernizing the city through economic development in the 1960s, to his philanthropy, Rappaport has contributed to improving the governance of the Boston area in each of the past eight decades, Liebman said. For his part, Rappaport ’47, J.D. ’49, M.C./M.P.A. ’63, believes that the institute has helped transform the relationship between Harvard and state and local government.